Eric Sloan, 19, isn’t officially on Delta’s Track and Field team, but he has already leaped over the team’s record of 50-feet and five inches, by one inch; this feat has made him one to watch. Due to a past injury, Sloan has been training for over a year. The spring will be his comeback season. 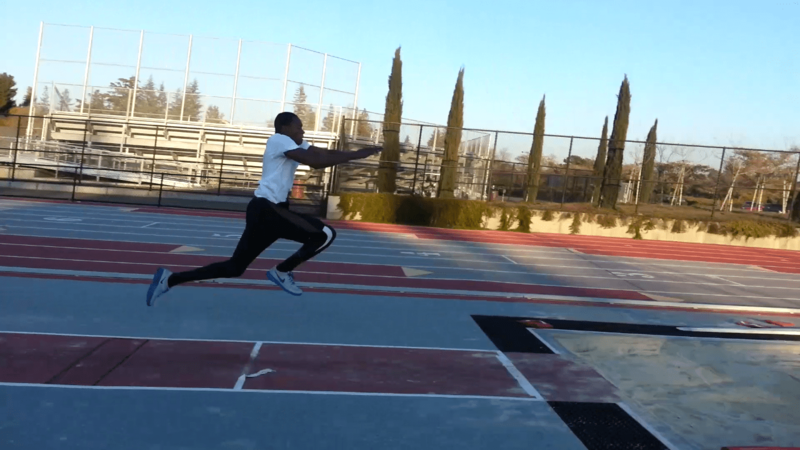 He was one of the best long jumpers on Bear Creek’s high school team. His senior year saw interest from various colleges, including the University of Nebraska. It all slipped through his hands when an accident sent him to the hospital. “I was playing around at practice and I was doing a high jump. When I went up for my jump, I just felt like a pop,” Sloan said. In the first meet of the season, Sloan ruptured his patellar tendon. He was hospitalized for four days. “I had to have surgery that same day. I went home, and I stayed home for about like a month. I went back to school. I was on crutches and I was late to all my classes, that was kind of embarrassing,” he said laughingly. To better recover, Sloan was home-schooled for the rest of the year. Attending Delta was not part of his plan, but his chances of a scholarship diminished. “Once I got injured they just didn’t want me anymore,” he said. Sloan aspires to transfer out of state next year. Going pro is a goal, but his injury has impacted his career choices. “I probably want to major in something like sport medicine. My sports medicine doctor was cool,” Sloan said. The knee injury has left no fear, believing it won’t happen again. In February, Delta will see how far Sloan can go.